Hey, no worries, it isnt real at all, actually Luis Tejeda did this impressive scene with Pulldownit in 3D Max, in this article, he kindly share some details with us. After the success with the winegalss breaking test, I decided to try something bigger with Pulldownit to test the real power of this amazing plugin. I wanted to portray a scene of destruction as credible as possible by using a real world model. I decided to recreate Saint Pancras Station in London. It is an emblematic train station, which connects the European continent with the British Islands through a huge tunnel. I liked it and I thought it was a great candidate for my clip. Sadly I relied on just one machine to do this work, so I tried to keep the project as simple as possible by removing local lighting and some geometric details. Nonetheless, the model of the station isn’t low-poly at all, hopefully resembling the intricate look of the real station. I used an Intel i7 quad, 8 Gb ram machine, with an Nvidia Quadro FX3800 card. I must say with Pulldownit I did all the destruction work in less than 10 minutes. It was very easy to use. I’m practically a beginner with Pdi but everything went very smoothly. 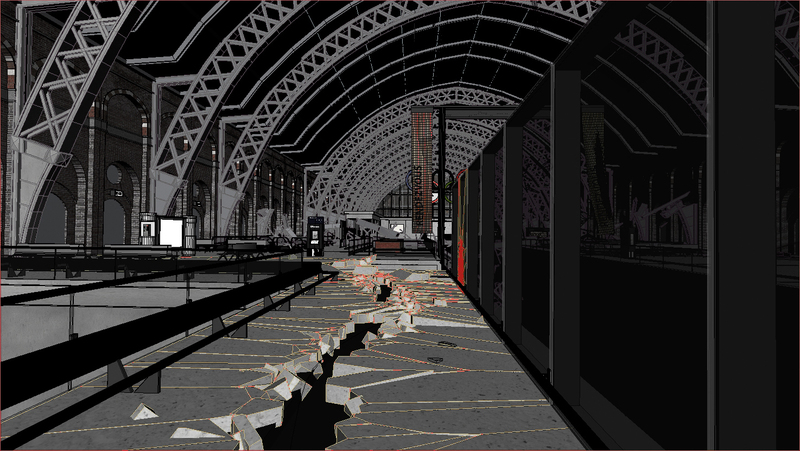 You can see several metal beams in the ceiling being destroyed, also some glass panels explode and finally a long crack is created all along the platform. I used Shatter it tool to pre-fracture all these, except the beams. 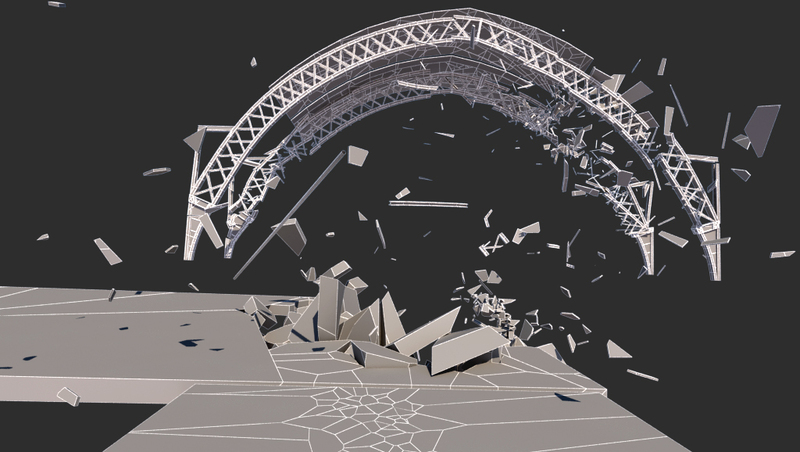 This is because I wanted them to break as single crossbars rather than in clusters, so I simply created fracture models for the beams’ geometry. I think the end result looks more real by breaking them this way. 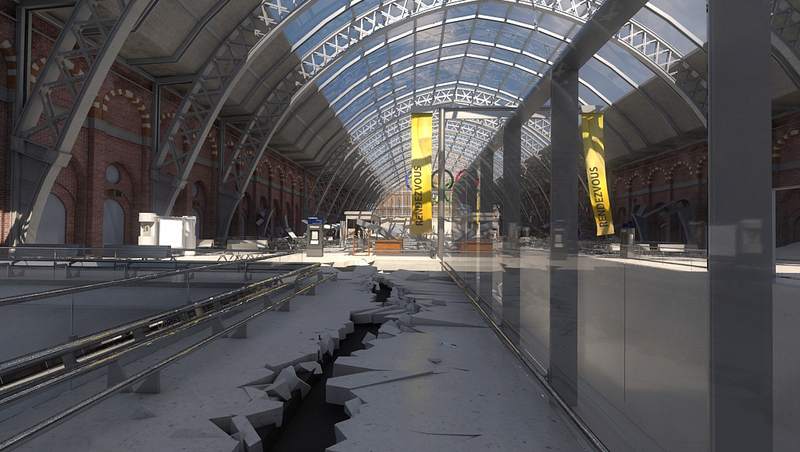 The ceiling of Saint Pancras is a kind of industrial glass so I used a radial shatter style to get the best glass breaking effect when the meteor hits. In reality, the meteor I used for this shot was much bigger than the one shown. This way I was able to get bigger potency thus making the effect much more impressive. I simply hid it from the screen and displayed the smaller one instead. In the end it looks like the small meteor generates the shock waves, which give way to the rest of the wreckage. In addition, the ceiling is resting on hidden walls to keep it steady until first impact. For the three exploding glass panels I used uniform shattering. They break upon impact with the meteor; it was a straightforward task in dynamics. The platform floor next to the panels also has uniform shatter, but since I wanted some fragments to remain intact, I used Pdi advanced fractures to set which fragments should break and which not. To create the dynamic crack on the floor I used path-based shatter. This is a great feature of Pdi. It consists of a small sphere that moves along the fragments, cracking them like a little earthquake, very impressive. As a final touch I added a forgotten suitcase that interacts with the cracks and then falls into the gap when it topples over. I think it gives the scene a bit more drama and it was very easy to do. Dust was added in postpro using a plugin for After Effects called “Trapcode Particular”. I wanted all the destruction effects to be clearly visible so I added only a soft dust layer. Trapcode worked great for this, it allowed me to make the dust follow the meteor’s trajectory and also tweak the transparency, luminosity and the intensity of the dust layer. There is a videotutorial about this effect on my own channel: www.youtube.com/3dluistutorials . I also speak more extensively about modeling, shaders, lights and postpro for this clip. Luis Tejeda is a freelance 3D artist. He is located in Chicago, IL, USA.